Whether you’re working from home full time or just want an environment in which to be productive, the perfect home office must be inspiring yet also fulfill your basic work requirements. Depending on space and money restraints, a workstation may have to be situated in an existing room, so it’s important that home and work boundaries are kept as clearly defined as possible. Modern careers and the rise of the Internet are providing more and more opportunities to work from home, and some people are turning to this option instead of working in a traditional office. 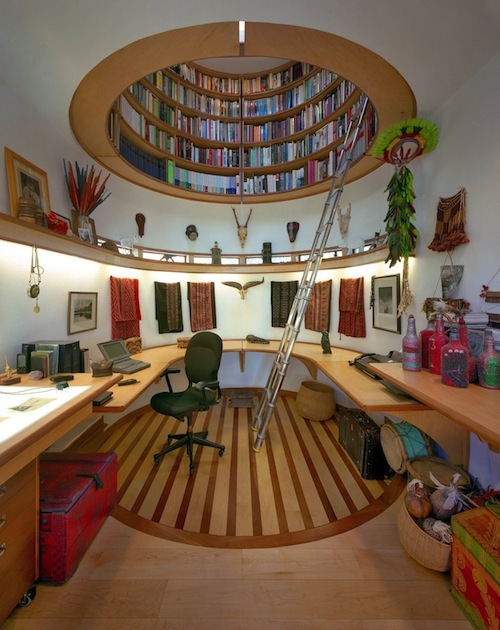 However, finding the ideal area in your home to help your mind focus can be a challenge – so let’s take a look at 10 amazing home offices that might prove to be an inspiration. Sometimes, creating an inspiring office space in your home takes a little innovation – and an industrious Hungarian DIY enthusiast assembled this home office from the front of an abandoned Ikarus bus. Ikarus is a Budapest-based company that was founded in 1895, and while their buses are a familiar sight on the country’s roads, they’re not something you’d expect to find in a Hungarian home. 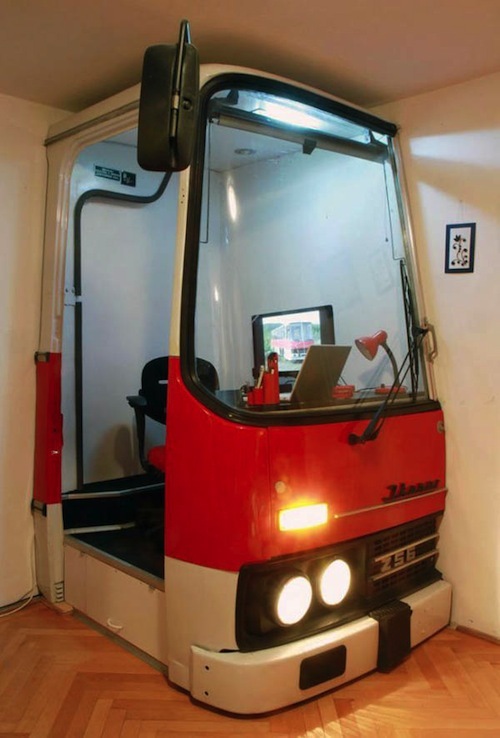 Still, even though the vehicle may look like an art installation, it’s also quite functional as a compact working environment. Its creator has replaced the dashboard with a computer desk, and the stationery holders, desk lamp and chair all coordinate with the color of the bus. The headlights are also fully functioning, so giving them a flash can soon cheer up any dull moments at work. The result is a rather aesthetically pleasing solution that’s sure to catch visitors’ eyes. Steampunk has been a popular sub-genre of science fiction since the 1980s – although there are a number of pop culture examples from earlier in the 20th century, such as Fritz Lang’s 1927 movie Metropolis and ‘60s TV show The Wild, Wild West. Steampunk presents steam-powered technology in anachronistic settings, conjuring up distinctive and often ingenious designs. 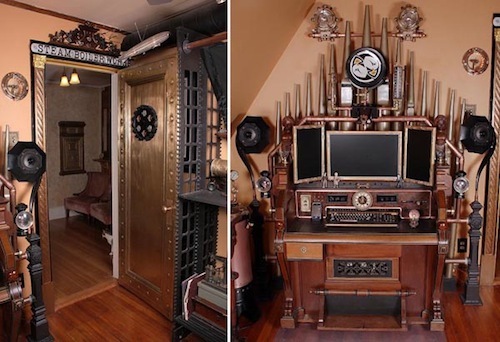 This distinctive steampunk-inspired office is to be found in a 1901 house located in Sharon, Massachusetts. It belongs to Bruce Rosenbaum, who’s actually designed his entire home around a steampunk aesthetic – but the office is his favorite room. The office lies behind an early-1900s bronze bank door and features a modern computer workstation that has been created from a Victorian pump organ. Rosenbaum explains that the room makes him feel as if he’s in the Nautilus, the famous vessel of Captain Nemo in Jules Verne’s 1870 novel 20,000 Leagues Under the Sea. 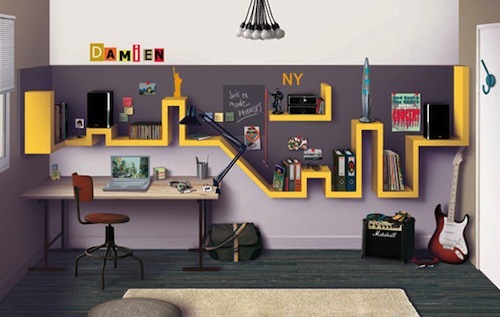 At first glance, this office may look like a normal work environment, but a second look reveals that the wall-mounted shelves have been designed to pay homage to the New York City skyline. Blocks of shelves mimic skyscrapers, creating plenty of storage areas for books, files, speakers and CDs. French design website ducôtédechezvous.com has published plans for the office so that NYC fans can design their own version. It was originally created with teenagers in mind, but it’s easily adaptable for professionals who need a stylish space in which to work from home. The plans could even be adjusted to incorporate LED lighting underneath the shelves – perfect for illuminating the desk while working late at night. This moody-looking office space is a shrine to science fiction. Even with the memorabilia in the front right of the shot, it’s clear where this fan’s main passion lies: Star Wars. The space’s two workstations provide ample room for being productive, and a model of Darth Vader stands guard while the owner is at work. Meanwhile, a wealth of closets hides less attractive-looking computer equipment – and perhaps even more science-fiction memorabilia. Shelves provide the ideal surface for fun accessories, and the large walls allow plenty of room for hanging movie posters. 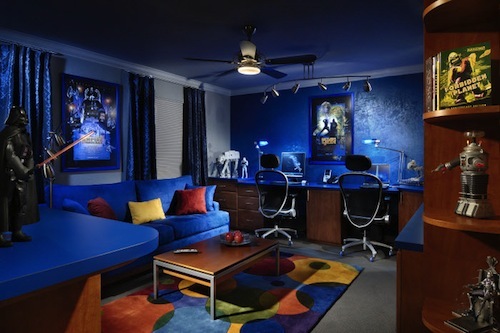 Finally, the intergalactic-inspired color scheme and the metallic-effect wall behind the computers combine to create an “out of this world” effect. 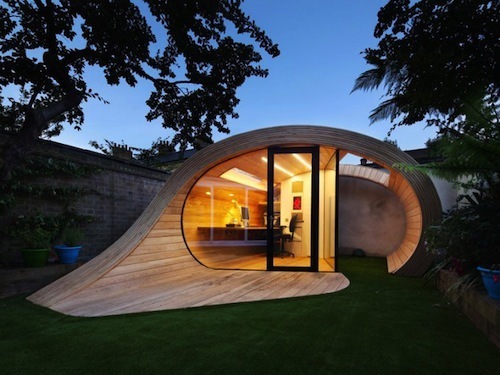 Nicknamed “the Shoffice,” this distinctive, futuristic-looking office space is located in the backyard of a 1950s house in St. John’s Wood, London, UK. London-based firm Platform 5 Architects worked alongside a structural engineer and a contractor when they designed the office. 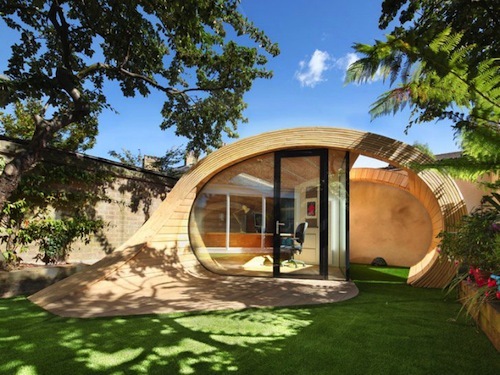 The curl of shaved wood inspired its unusual shape, and the result is a distinctive, artistic design that sits organically in the house’s garden. This workspace includes lots of glass, and there are two skylights providing plenty of natural light, so it should be cost-efficient to run. The Shoffice also features a cantilever desk and oak fittings, and it even has a built-in shed for standard garden storage. Even in your own home, being stuck behind a desk can be difficult – but this office environment would make the daily grind a lot easier. This interesting office is full of intriguing artifacts from around the world, which is hardly surprising when you discover that it belongs to Wade Davis – author, anthropologist, photographer, ethnographer and “explorer-in-residence” at National Geographic. Connected to Davis’ home by a glass greenhouse, the space allows this explorer to work in peace, while a neatly designed 16-foot dome holds a host of information just above his head. Architect Travis Price, who designed the workspace, describes the office as being similar to the Greek temple at Delphi. A home office can be the perfect environment to reflect your personality and passion. In this case, the vintage color scheme and furnishings make it clear that the owner is a fan of the Golden Age of Aviation. The centerpiece of the stunning office space is the curved metal wing desk, which is inspired by World War II fighter planes. The desk features a shiny aluminum exterior that’s wrapped around a hardwood frame. Keeping with the theme, built-in canvas-lined shelves provide storage areas, while a metal and leather chair coordinates perfectly with the desk. A British flag on the wall, brown storage boxes and the leather jacket on the coat stand complete the look. There’s even a vintage-looking telescope for scouting out enemy bombers! This smart workspace manages to remain clean and crisp as well as stylishly retro. Originating in France in the 12th century, Gothic architecture lasted around 400 years before it was overtaken by the Renaissance style. This office shows that Gothic design can be used to create a smart and elegant environment that combines dark and romantic elements with ease. 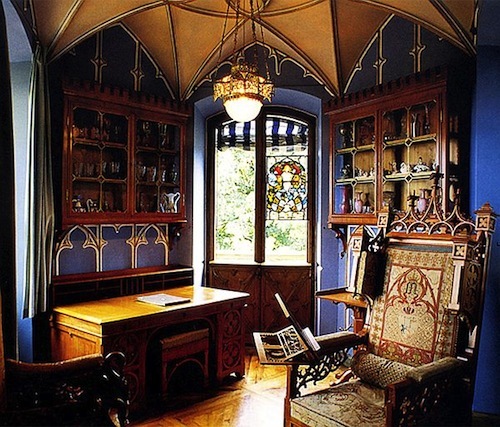 The style is known for its intricate architectural features such as ribbed vaults and pointed arches, yet at the same time Gothic architecture offers designers a certain amount of artistic freedom. “Ensure that your office reflects you and that it contains a favorite object or photo that will give you the break you need when you pause in your work,” says Jo Heinz, president of architecture and design firm Staffelback. “It is these small touches that help you make the space your own.” This office certainly has a bold aesthetic, and while it’s perhaps not ideal for those who are easily distracted, we’re sure Count Dracula would feel right at home. 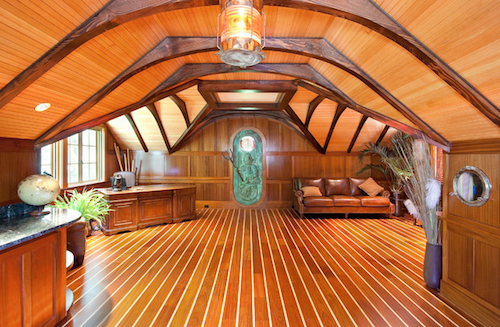 This nautical-themed office is a magnificent working environment – a stunning office that’s covered with wood from ceiling to floor. Sat in it, you might find yourself drifting off, daydreaming that you’re out on the seven seas – albeit in a remarkably spacious ship. “If you work from home full-time, you’re going to be spending as much time in your office as you do in the rest of the house. Don’t treat your working space as a second-class accommodation – give it the importance it deserves,” says home office expert Lisa Kanarek. This office’s design includes trim work by South Carolina-based custom interior trim designer TreeMarsh. A custom-carved door emblazoned with Neptune breaks up the wood effect in the most nautical way possible. The Roman god of the sea is clutching his trident, which doubles up as a rather stylish door handle. There’s even a small porthole, and the office also includes a globe of the world – which no self-respecting sailor should be without.